On the 16th May 1975 due to Local government reorganisation the Angus Fire Brigade and the Perth and Kinross Fire Brigade were amalgamated to form the Tayside Fire Brigade. The Brigade provides fire cover to three Councils: Angus Council, Dundee City Council and Perth & Kinross Council. 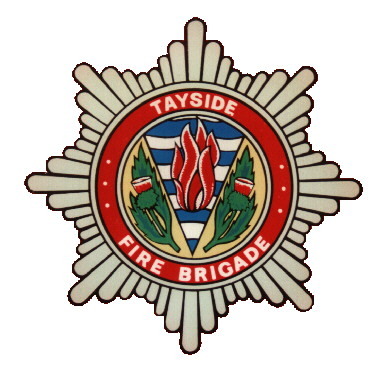 The Brigade is governed by the Tayside Fire Board, which consists of eighteen members from the above three Councils. The Brigade is split into two Divisions. 2 Prime Movers 1 BA Support and 1 Canteen Pods. The Command and Control Centre is a separate building at Macalpine Road and has a staff of twenty. Blackness Road, DUNDEE, DD1 5PA. In 2002 it cost �153,103 to buy a Water Tender Ladder and �388.17 for Protective Personnel Equipment for a Firefighter. 12/6/2010 In the Queen's Birthday Honours List Chief Officer Stephen Hunter was awarded the Order of the British Empire. 13/4/2010 The new Fire Station at Pitrevie, replacing Dunfermline and Rosyth stations, is due to be officially opened today. 11/2/2010 Tayside's first Aerial Rescue Pump went on the run today at Blackness Road at 8am. 13/6/2009 In the Queen's Birthday Honours List, Watch Manager Frazer Andrew MacDonald was awarded the M.B.E for services to the Prince's Trust. Airlie Mobile Volunteer Unit closed 31st March 2005. Tayside Fire Brigade's first Heavy Rescue Unit (HRU) went on the run on Wednesday 10th November 2004 at Stn 2 McAlpine Road, carried by Prime Mover SP54EDJ. Tayside Fire Brigade's first Rescue Pumps went on the run on Wednesday 25th August 2004 at Stn 2 McAlpine Rd and Stn 21 Perth . Biggest difference to a normal first appliance is that they carry a dedicated Weber Cutter and Spreader as opposed to a combi tool, they also have 2 Zumro NT Airbags, spinal board but don't carry an LPP. The Brigade was restructured from 2 Divisions into one on 28th June 2004 and the stations renumbered. Firemaster Stephen Hunter was awarded the Queen's Fire Service Medal in the New Year's Honours List in December 2003. Firemaster Marr retired on the 8th June 2001.